Pixar has made a lot of wonderful animated films in its time, like Wall-E and Toy Story, but none of them have been as quite as emotionally-wrenching or beautiful as Up, which is the story of a grumpy old man who learns to love again in the wake of his wife’s death after embarking on an adventure with a stowaway Asian boy in a house that goes flying to South America via balloons. It’s a wonderfully cute story, but there’s no way a house can fly, can it? Well, as it turns out, experts from the National Geographic Channel were able to recreate Up’s flying house at a private airfield outside of Los Angeles, California, over the weekend. The stunt was conceived by the National Geographic Channel for their upcoming show, How Hard Can It Be? 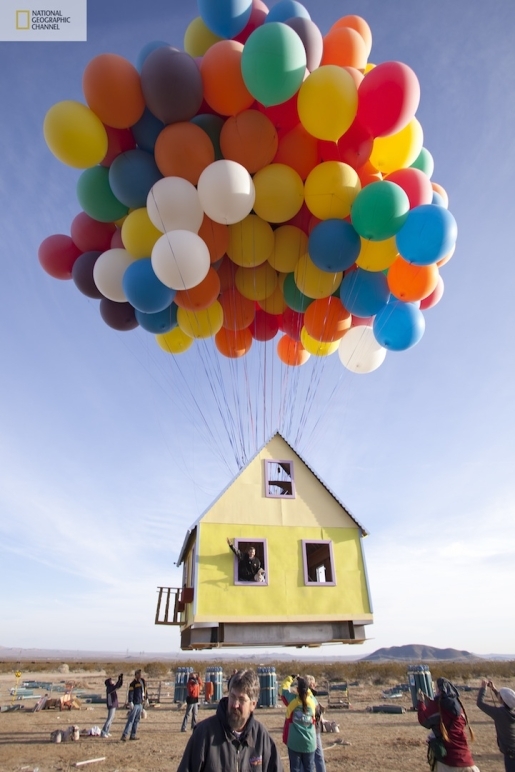 In the process of making a 16×16, 18-foot-tall house fly, they also managed to set a world record for the largest cluster balloon flight ever attempted. The team of professionals was able to make the house reach an altitude of 10,000 feet and flew the house for more than an hour before safely landing the domicile again. It’s a pretty incredible feat, given the amount of work involved in flying the house safely then landing it again. When Pixar was dreaming about Up in their offices, do you think they ever imagined that someone would bring it to life?